We are Celebrating Four Years! September is our favorite time of year at Marcel's since it is our anniversary month! Help us celebrate 4 years by decorating a birthday cake to display in our window and stay tuned for not-to-be-missed birthday week promotions and raffles. 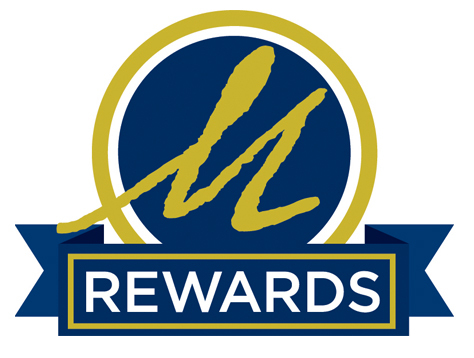 We are also thrilled to introduce our new loyalty program - M Rewards. Start collecting points September 1st. Celebrate late summer in Glen Ellyn at Sounds on the Street and Fall Crawl, a 4 day shopping weekend filled with special events. Don't miss your chance to meet Pastry Chef Mindy Segal, owner of HotChocolate in Chicago. She will be at Marcel's baking delectable treats from her acclaimed book Cookie Love. 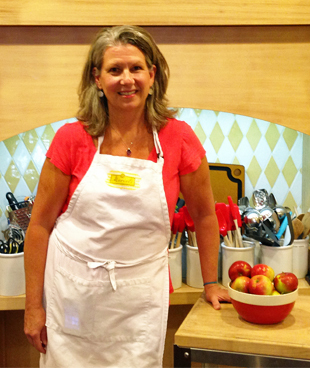 This month, the spotlight is on Kathy Lawson, our fantastic Culinary Assistant Coordinator. Looking for a deal? 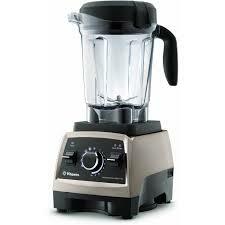 Swiss Diamond Fry Pans and Vitamix Blenders are our featured promotions! 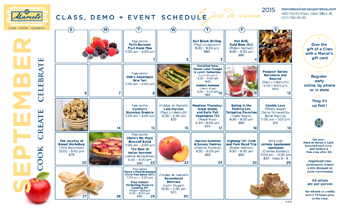 The September class calendar is filled with great classes as summer transitions to fall. 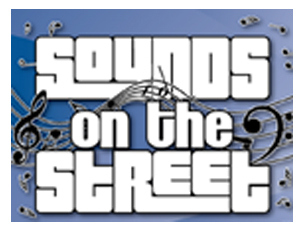 Celebrate late summer in Downtown Glen Ellyn at Sounds on the Street! Come on out with your family and friends for a live concert and food on Main Street, between Hillside and Duane. School of Rock bands will kick off the night at 7pm and the featured band will hit the stage at 8pm. Bring your local fare and libations out onto the street from participating restaurants: Wooden Barrel, Santa Fe, fire + wine, Blackberry Market, Shannon’s, and Cab’s Wine Bar Bistro. It's a great night to enjoy the best of Glen Ellyn! 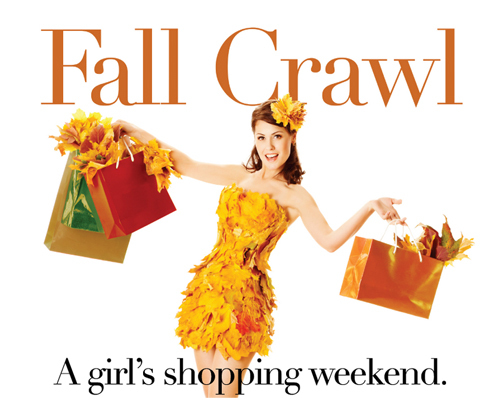 Grab your girlfriends and get ready for a Glen Ellyn Girl’s Shopping Weekend! 4 days filled with grand openings, wine tastings and trunk shows at your favorite stores. The weekend kicks off Thursday, the 17th with fashion show luncheons at A Toda Madre. Marcel's is celebrating with special promotions each day (stay tuned! ), a cooking demonstration on Friday and a visit from Pastry Chef Mindy Segal on Saturday. James Beard Foundation Outstanding Pastry Chef Mindy Segal, owner of HotChocolate Restaurant and Dessert Bar in Chicago, is serious about cookies. 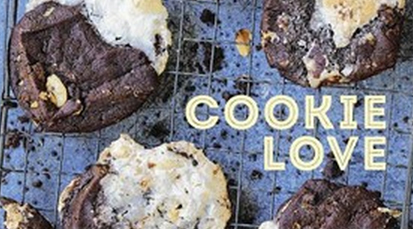 Cookie Love is the new go-to, never-fail reference for turn-out-perfectly-every-time cookie recipes. Mindy will be at Marcel's sharing all of her secrets for turning classic recipes into more elevated, fun interpretations of everyone's favorite sweet treat. You don't want to miss Mindy, self professed "cookie nerd", at this super fun event. Sign up here! our loyalty program specially designed to reward our customers! Starting September 1st, earn 1 point for every $1 spent on merchandise or classes (does not apply to gift cards or cookbooks). Collect 1,000 M Rewards points to earn $20 to redeem at either Marcel's or Marché. M Rewards will replace our current punch card program for classes. If you have a punch card from a cooking class, bring it in and we will apply 200 points to your M Rewards account for each hole punched. If you have paid for a class you have not taken yet, your loyalty points will be automatically adjusted to reflect that purchase. Points never expire. Happy Shopping! The holidays are approaching; let us help you plan an exquisite event! Company parties, family get-togethers and girl's night out are all fabulous ways to experience the magic of the Marcel's kitchen. Contact us today and we will start crafting the menu, libations and special touches to make the event uniquely yours. COOK CREATE CELEBRATE & DECORATE! Join Marcel's as we celebrate our FOURTH Anniversary on Saturday, September 26th! We will be celebrating all week long, from Monday, September 21st through Sunday, September 27th. Make sure you stay tuned to your Marcel's emails and our Facebook page to learn of our daily promotions, raffle prizes and fun celebration treats sprinkled throughout the week. As always, we are thankful to each and every one of you, our faithful friends and supporters, for making this day happen! Let's continue to Cook, Create and Celebrate together! 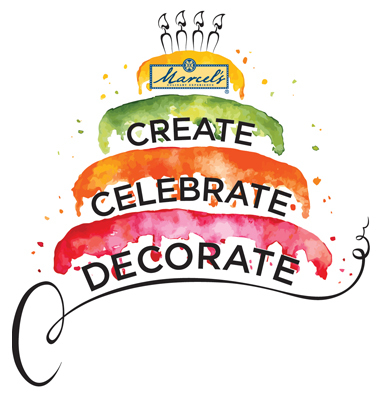 Channel your inner artist and CREATE a 3-tier birthday cake for our anniversary celebration window! Simply stop by Marcel's to pick up 3 styrofoam tiers and then get creative and crafty at home with paper, paints, sequins, or whatever non-perishables you can imagine... Return throughout the month of September; all creations will be added to our window display. We can't wait to see how festive our window looks with the help from our loyal customers, adults and kids alike! P.S. Get a reward for your efforts! If you have ever taken a cooking class at Marcel's you very likely have met the lovely and energetic Kathy Lawson, who has been a Culinary Assistant for 2 years and was recently promoted to Culinary Assistant Coordinator! Kathy originally hails from New England, but has lived in the Chicago area for 30 years. Married to her husband Dennis for almost 3 decades, they have 3 children, 2 daughters-in-law and a 20 month-old grandson! Kathy's career in the investment industry followed her to Chicago from NYC. Opting to stay at home after her children were born, she enthusiastically dedicated her time to volunteering for "everything under the sun." When her youngest went to first grade, Kathy worked as a substitute teacher and tutor. In addition to her role at Marcel's, she is currently on the board of the Friends of the Glen Ellyn Library and runs the used book sales for them. West Suburban Gem: The Illinois Prairie Path for biking, running or walking. My favorite section runs with few cross street interruptions south of Roosevelt Rd in Wheaton and winds past St. James Farm all the way west to Eola Road. It's just you and the trees and the birds. Favorite Book: A Tree Grows in Brooklyn by Betty Smith. I first read this when I was about 12 and have probably reread it 10 or more times since then. Favorite Food Destination: Cape Cod, where I spent summers growing up and where my mom now lives. Every visit packs in my yearly quota of lobster and clam rolls and "chowdah". Three ingredients always in my fridge: Feta cheese for pasta, salads and emergency appetizers. Tahini for my frequently made homemade hummus. Cider Syrup - I first saw this at a farmer's market in Somerville, MA with my daughter Sarah who lives there. It's a fun, tangy substitute for maple syrup that I drizzle on oatmeal, and add to salad dressings and marinades. Current Recipe Project: Being the height of summer I'm trying to can as many jams (both savory and sweet) and pickles as I can to carry me through the dismal days of winter. I love to see all of those beautiful jars lined up on my basement shelf. My favorite restaurant: The Gage on Michigan Avenue downtown. My son Duncan works nearby and this is where we occasionally meet for lunch. They do really lovely, creative things with soups and salads, and are known for their gourmet pub food. My guilty pleasure: If the house is quiet, reading in the middle of the afternoon even if there are many more productive things I could be doing. Favorite thing about working at Marcel's: When I first signed on as a Culinary Assistant, one of the more "seasoned" assistants assured me that I'd learn something new every class. I wasn't convinced that this was possible- surely at some point the classes would become repetitive and I'd know pretty much every tidbit that the Marcel's chefs had up their collective sleeves. Well, with over two years worth of classes under my apron belt, I admit that my coworker was right. It might be something as simple as a different way to crack an egg and pour it into a pan so that it retains it's shape, but there's been SOMETHING every single class. I'm looking forward to many more similar learning moments! Five pre-programmed settings ensure simple cleaning, walk-away convenience, and consistent results for smoothie, frozen dessert, soup, and purée recipes. Perfect for family meals and entertaining and fits comfortably under most kitchen cabinets. Simplify your cooking experience with the Swiss Diamond Fry Pan Duo. 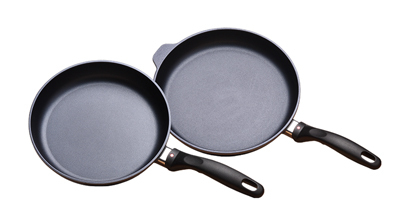 This trusty pair of kitchen staples combines the top selling 9.5 and 11 inch Fry Pans. High-quality, versatile, and easy to clean, cook everything from a simple cheese omelet to a melt-in-your- mouth steak on the diamond-reinforced surface. These long-lasting pans boast excellent heat conduction to sear like stainless steel without the messy clean-up. The surface is so nonstick that you don't need to use any additional oil or fat, encouraging a healthier lifestyle. BREAKFAST NOW, DINNER LATER TONIGHT & LUNCH TOMORROW! Chef Lynn is back with a twist on her popular midday Breakfast Now, Dinner Tonight series. She has added lunch! Lynn greets you with a cup of freshly brewed coffee, serves you breakfast and demonstrates a step-by-step dinner recipe for tonight. Lynn will also provide a second version of the dinner recipe to help turn this main dish into something for lunch tomorrow! Along with the recipe and the new-found-know-how, you'll receive a "dinner starter kit" with two main ingredients from Marcel's to use as the foundation to your meal. With the addition of a couple other on-hand items, lunch & dinner's in the Marcel's bag! With root vegetables, gourds, apples, and shorter days right around the corner, it's easy to want to cling to the butter-slathered ear of corn, the last bowl of berries, and tomatoes so ripe you can eat them like a peach. Summer is fading fast but Chef Heidi is offering a lingering taste of summer's best; one last hurrah to enjoy summer to the very end. Tips on how to modify the menu to the changing season will be included! Indian summer; cooler nights, leaves falling, and a sudden desire for heartier fare. The change of seasons is as good a reason as any to gather your closest circle to savor a casual meal highlighting the upcoming flavors of fall while holding on to the end of summer. The perfect in-between-the-seasons meal to shake off the soon-to-be-over summer blues. There are as many variations as there are French regions that claim founded this round, flat, flaky pastry. Both savory and sweet, the galette is beautiful, easy to slice and simple to eat, pizza-style, while standing. The miraculously easy and versatile pastry dough can be filled with all sorts of fruits or vegetables and because the tart is free-form, the pastry can be rolled into a round, rectangle, or any shape you wish. A hearty focaccia and savory pizzette complements the menu. Who knew delicious could be so easy!